Kanchanaburi is most well known for the Bridge Over the River Kwai, part of the Japanese Death Railway built during World War II. In addition to WWII sites, Kanchanaburi is home to an excellent selection of natural attractions and peaceful riverside resorts. Mae Nam Kwai Road runs from central Kanchanaburi down to the River Kwai area. This road is where you’ll find most of Kanchanaburi’s inexpensive backpacker accommodation, as well as a selection of local bars and restaurants. The River Kwai Railway Station is located close to the famous Bridge Over the River Kwai, in the heart of Kanchanaburi’s tourist district. The area around the Railway Station is where you can find most of Kanchanaburi’s high-end restaurants and luxury resorts. Located in the centre of Kanchanaburi, Kanchanaburi Railway Station is where you’ll arrive in Kanchanaburi if you’re travelling by train from Bangkok. The train station is close to the Allied War Cemetery and the Thailand-Burma Railway Centre. More than 60,000 Allied prisoners of war and 180,000 civilian labourers died while building the infamous Death Railway during World War II. 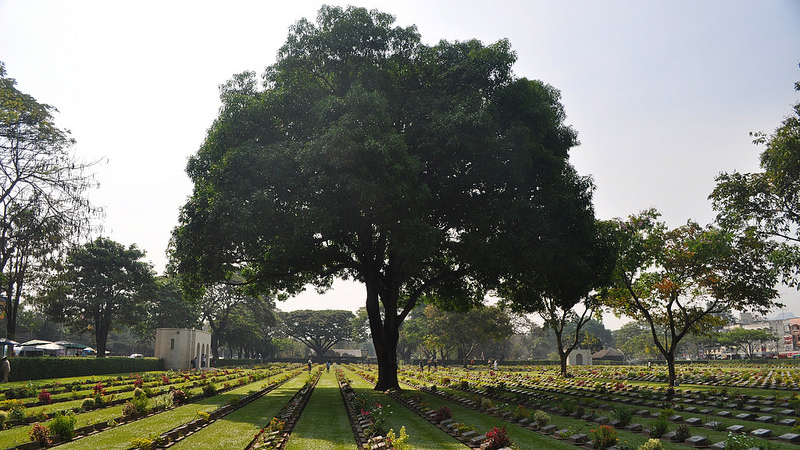 Kanchanaburi War Cemetery is the resting place of almost 7,000 Australian, Dutch and British prisoners of war. provides a selection of interesting exhibits about the bridge’s construction and Thailand’s role in World War II. Built by the Australian Government in 1998, the Hellfire Pass Memorial Museum documents the construction of the Death Railway during World War II. Over 1,000 prisoners of war were forced to work on the mountain pass, of which more than 700 died. A four kilometre walking trail passes through the area surrounding the pass, letting you get a look at the region in which the POWs worked. The memorial museum is about one hour from Kanchanaburi by bus or private taxi. 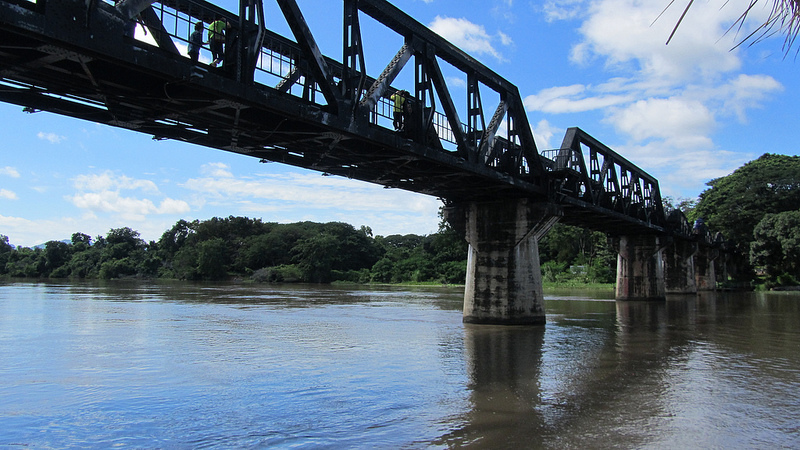 Built by Allied prisoners of war during World War II and famous depicted in the 1957 film, the Bridge Over the River Kwai is Kanchanaburi’s most well-known landmark. The bridge itself is open to the public and easy to access from River Kwae Bridge Station. There are several elephant camps around Kanchanaburi offering visitors the chance to see some of Thailand’s most impressive creatures. 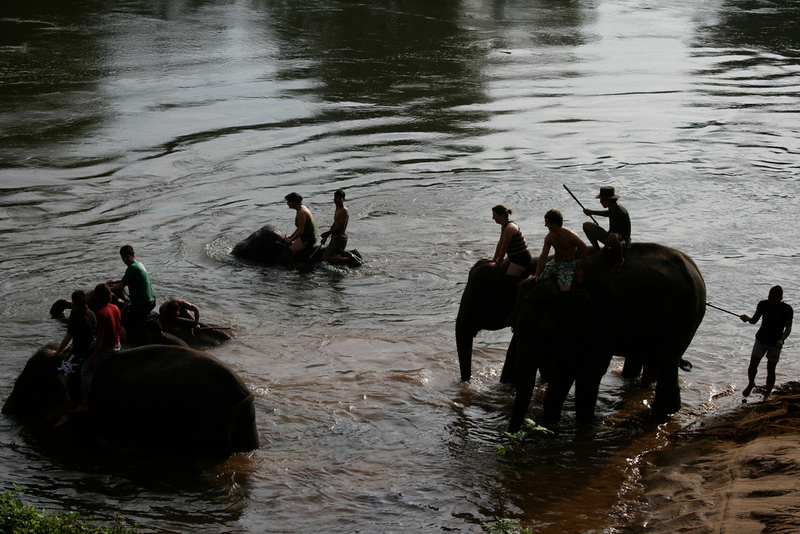 Elephants World and Taweechai Elephant Camp both offer a humane, environmentally responsible elephant riding experience. Kanchanaburi is close to several of Central Thailand’s most impressive national parks. Sai Yok National Park, which is a short drive from Kanchanaburi itself, is home to a selection of impressive waterfalls and hiking trails. The famous Erawan Waterfalls are located inside the Erawan National Park. Access to the national park is 200 baht for non-Thai citizens. Visitors can swim in the water surrounding the falls, although water levels can be low during the dry season. Located inside Khao Pun Cave, Wat Tham Khao Pun is a small but impressive Thai Buddhist temple complex. The well lit caves are close to Kanchanaburi and conveniently located near one of the best viewpoints over the River Kwai. Famous for its limestone mountains, Srinakarin National Park is one of several national parks within easy reach of Kanchanaburi. Waterfalls, hot springs and great walking trails make this a good day trip destination for people that love the outdoors. Over the last decade, several high-end hotels and spas have opened in Kanchanaburi. If you feel like a relaxing break, try one of the massage treatments at the Ficus Spa, located inside the luxurious Felix River Kwai Resort. Kanchanaburi’s most luxurious resort, Dheva Mantra Resort and Spa is located on the banks of the River Kwai a short distance from the infamous World War II bridge. Spacious rooms, a large swimming pool and luxurious spa make this a great choice for relaxing holidays. Located on a quiet bend close to the River Kwai Noi, X2 River Kwai Resort is an ultra-modern resort with a selection of spacious cabins and villas. This resort’s quiet location and luxurious rooms make it a good choice for people that want to relax beside the river. Located very close to the World War II bridge, U Inchantree Kanchanaburi is a peaceful four star resort with fantastic views of the River Kwai. Although the rooms are smaller than other luxury hotels in the area, the grounds and riverside swimming pool are perfect for relaxing. Located upriver from the Death Railway bridge, Kanvela Resort is a quiet and peaceful three star resort on the River Kwai. Modern and minimalistically decorated twin and double rooms are available at reasonable prices. With a great location on Mae Nam Kwai Road close to Kanchanaburi’s restaurants and bars, Sabai@Kan Resort is a good choice for travellers that want to be in a convenient location in easy reach of Kanchanaburi’s top attractions. Located on Mae Nam Kwai Road, Good Times Resort Kanchanaburi offers a selection of comfortable rooms in a convenient location. This hotel is a short distance from Kanchanaburi Railway Station and the city’s World War II Cemetery. Located on Singapore Road, Bure Homestay is a short walk away from Kanchanaburi’s bars and restaurants on Mae Nam Kwai Road. This affordable two-star hotel offers a selection of modern, clean double and twin rooms. Located on the opposite side of the River Kwai from Mae Nam Kwai Road, Jim Guest House offers a selection of quiet bungalows that are a short walk from the city. Rooms are tastefully decorated, clean and fairly priced. Affordable rooms and bungalows with fantastic views of the River Kwai make Bambooya Resort one of Kanchanaburi’s best budget hotels. This cheap and simple resort is a short walk away from the restaurants and nightlife on Mae Nam Kwai Road. A short walk from U Inchantree Resort, The Loft offers modern international dining with great views of the River Kwai and the World War II bridge. The large menu covers several different types of cuisine, making this a good choice for people seeking great tastes and variety. Paris Kan is a small French/Thai restaurant on Mae Nam Kwai Road. Owned by a French expatriate, this restaurant serves a menu made up of French and Italian dishes along with several imported wines and fresh bread. Located on Donruk Road, Zeb zeb is a cheap and tasty Thai restaurant located a short walk away from the Kanchanaburi War Cemetery. Popular with locals and expats, Zeb zeb tends to attract a crowd around dinner time, making it wise to show up early. On’s Thai Issan offers a great selection of Central Thai and Isaan dishes in addition to a large vegetarian and vegan menu. This restaurant also offers cooking classes for tourists interested in learning the art of Thai cooking. Located on Mae Nam Kwae Road, a short distance away from the World War II bridge, this Thai/international restaurant serves a selection of tasty dishes. Kanburi outdoor setting and affordable food make it a great choice for entertaining friends and family. Nut’s Restaurant serves fresh curries, soups and rice and noodle dishes in a location that’s a short walk from the River Kwai. The simple menu of Thai classics makes this a good choice for visitors to Kanchanaburi that want to experience real Thai cooking. Located across the River Kwai from the majority of Kanchanaburi’s restaurants and nightlife, Mangosteen Garden Restaurant serves a selection of Central, Southern and Northeast Thai dishes in a relaxing and quiet setting. There is no public airport in Kanchanaburi. Buses to Kanchanaburi leave frequently from Sai Tai Taling Chan bus station in Bangkok. First class buses, for which tickets are available at a cost of 110 baht, leave Sai Tai Taling Chan station every 15 minutes from 5 am to 10:30 pm. Minivans, which leave from Victory Monument in Bangkok, offer a quicker way to get from the capital to Kanchanaburi. Minivan tickets are available from the station beside Century Movie Plaza, which is a short walk from BTS Victory Monument. 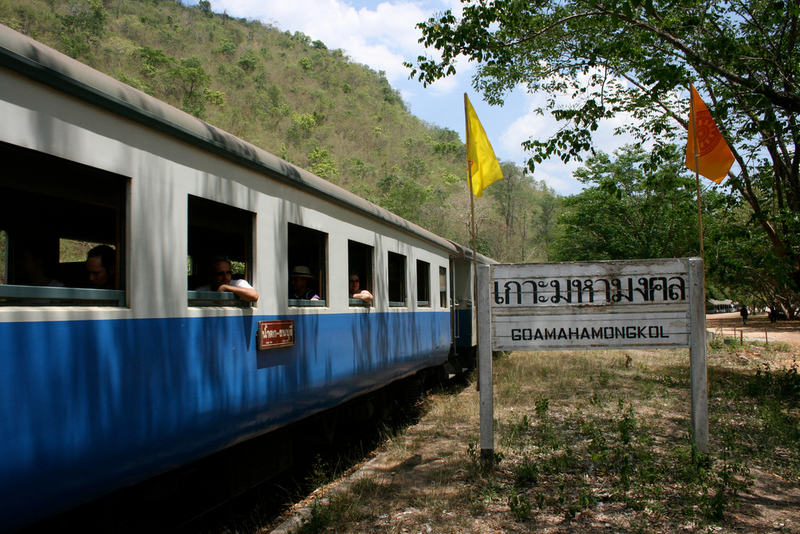 There is a daily train service from Bangkok to Kanchanaburi that leaves at 7:50 am daily. The train departs from Thonburi Train Station (not Hua Lamphong Station) and takes around two and a half hours to reach Kanchanaburi. Tickets are available from 100 baht per person. A second train leaves from Bangkok’s Thonburi Train Station at 1:55 pm daily, with tickets available from 100 baht per person. Note that traffic around Thonburi Train Station can be quite heavy in the morning, making it worth leaving your hotel early to get the train in time. 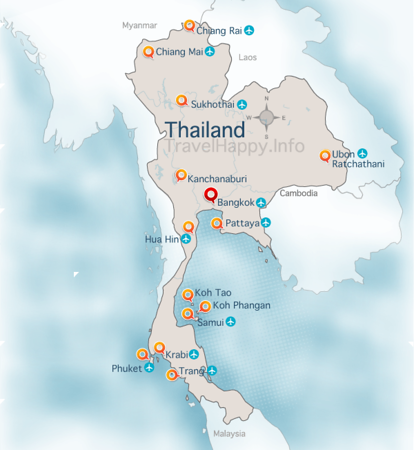 The nearest airports to Kanchanaburi are Bangkok’s Don Muang and Suvarnabhumi Airports. Check Skyscanner to compare airlines for the best prices and flight times to Kanchanaburi.